Linguists will know John Benjamins as one of the nicer academic publishing houses, not quite so terrible as Elsevier or other profiteering behemoths, and one with really good typography to boot. Iconicity afficionados will probably know the Iconicity in Language and Literature series published by Benjamins. One of my first articles on ideophones and iconicity appeared in this series and though since then much of my work has appeared in journals, I’ve just written a contribution for another volume in the series (this one edited by Kimi Akita and Prashant Pardeshi). I’ll share that paper on another occasion; here I just want to share a CSL style I created to make my life easier. If you’re just after the style, download it here (and see instructions for use here). If you want some background, feel free to keep reading. What is a CSL style? It’s nothing more than a way to convert those annoying prose descriptions of citation styles (examples below) into simple programmatic statements that a reference manager like Zotero can understand. The goal, as always, is to save time by automating things so that your brain cycles (and mine) can be devoted to the stuff we really are paid for: science! 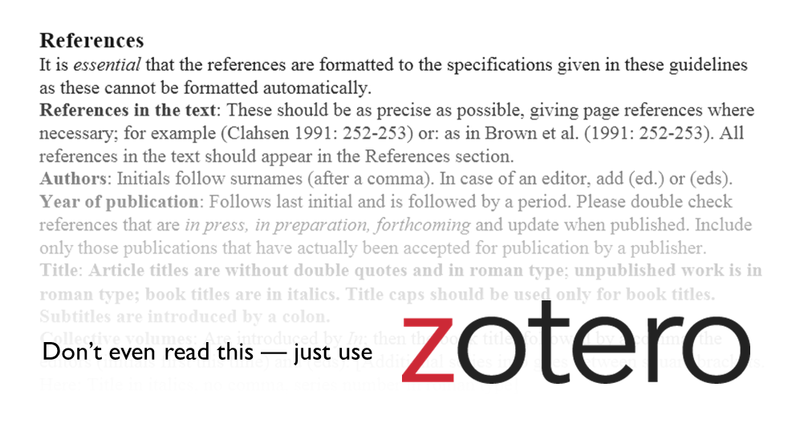 Oh and by the way, if you don’t use a reference manager yet, have a look at my Zotero tutorial. REFERENCES. It is essential that the references are formatted to the specifications given in these guidelines as these cannot be formatted automatically. References in the text: These should be as precise as possible, giving page references where necessary; for example (Clahsen 1991: 252-253) or: as in Brown et al. (1991: 252-253). All references in the text should appear in the References section. Authors: Initials follow surnames (after a comma). In case of an editor, add (ed.) or (eds). Year of publication: Follows last initial and is followed by a period. Please double check references that are in press, in preparation, forthcoming and update when published. Include only those publications that have actually been accepted for publication by a publisher. Title: Article titles are without double quotes and in roman type; unpublished work is in roman type; book titles are in italics. Title caps should be used only for book titles. Subtitles are introduced by a colon. Got that? Especially the subtleties about authors being introduced with initials following surnames (Bowerman, M.) except when they’re editors, when they should come with initials first (M. Bowerman)? Yeah I missed that too. But that’s because I didn’t read it in the first place — I never try to read these things. If the publisher is too bespectacled and bookish to use a named style I always submit my work using the Unified Stylesheet for Linguistics Journals and wait to see what comes back. In this case the editors can back to me with a document where all the “and”s in multi-author references were turned into “&” and the first names for some of the authors were initialised, manually, with a note asking would I be so friendly as to initialise all of them. Of course I would! Except I don’t to manual labour if I can avoid it. I just tell Zotero to initialize-with="." and it’s done in one fell swoop. And because I don’t want anyone else to work through this prose description and be lured into thinking it is normal to make these kinds of changes manually, I’ve turned it into a simple CSL style. Writing a chapter for a John Benjamins volume in linguistics? Please go ahead, use the CSL style and never look back. Happy writing, and don’t forget to use a reference manager! This entry was posted in Academia, Zotero by mark. Bookmark the permalink. Dear Mark, this is great, thanks! Also thanks for the “Unified style sheet for linguistics” CSL style you provided earlier. Now my question: you are certainly aware of the “The Generic Style Rules for Linguistics”. Unfortunately, there seem to be quite some differences to the “Unified…” style. Is there a CSL style for that too? I cannot find it in Zotero’s style repository. Hi Sebastian, not aware of a CSL style implementing those; I was under the impression that they were quite close to the Unified style sheet… If you’re badly in need of it, the Zotero forums are extremely helpful and there’s a simple guideline for requesting styles.